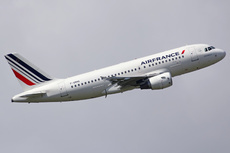 Owner/operator: Air France, opf HOP! On June 27, 2016, at 16:45 hours local time, the crew of flight HOP25PG, an Airbus A319, was performing a visual approach for runway 31R at Marseille-Provence Airport, France. At the same time, a Eurocopter Cougar helicopter (F-ZWBS) was returning from a VFR flight to the east of the facility, and was descending to 1,500 ft to the aerodrome circuit entry point. Since the transponder of the helicopter failed during the flight, the air traffic control only had primary radar contact. While on base leg, the Cougar crew hovered without informing the controller. Primary radar contact with the helicopter was lost at this stage. The Cougar moved towards the MS beacon and the two aircraft crossed each other without the crews having received information about their respective presence. Visual contact between the crews of both aircraft was established after crossing. The minimum separation values were 0.19 NM (350 m) horizontally and 240 ft (73 m) vertically. - the lack of provision of information to the controllers on the existence of zones of non-visualization of primary radar echoes. - a possible overconfidence between the tower controllers and the Cougar crew, professionals based on the platform, which may have led to less rigor in the accuracy of the position reports and the use of them for the traffic management.